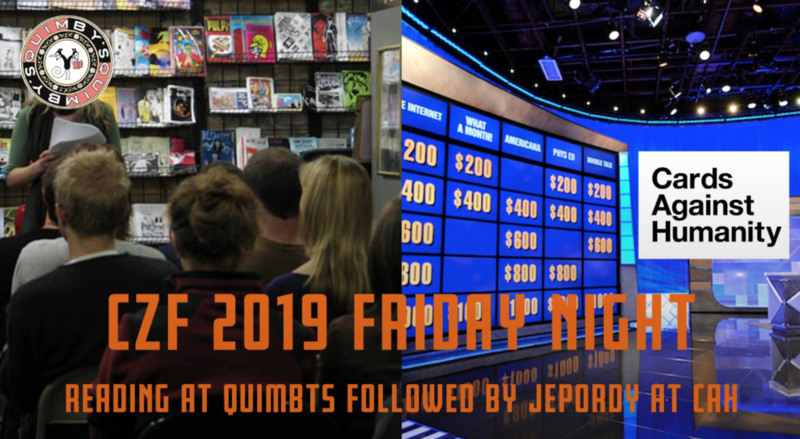 On Friday night of #CZF2019, Chicago Zine Fest has two special events. The annual Exhibitor Reading will be here at Quimby’s Bookstore, Friday May 17th from 6-8pm. Zine creators share stories and comics from the pages of their publications. Hosted by Megan Kirby. Readers include David Alvarado, Julia Arredondo, Ed Blair, Eileen Chavez, Casey Goonan, Jonas, Jaclyn Miller, LizMarie Palomo, Leslie Perrine, Jami Sailor, and Alejandra Trigoso. 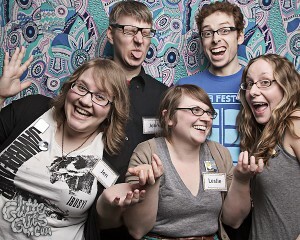 Afterwards head over to the Cards Against Humanity Theater (1551 W. Homer St) for Zine Jeopardy at 9pm. 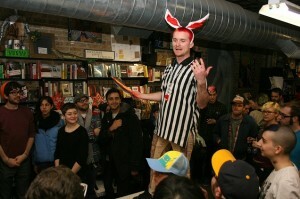 Chicago Zine Fest organizer Johnny Misfit will host and contestants John Porcellino, Julia Eff and Billy the Bunny will go head-to-head as we test their knowledge of all things zine. More info about that here. 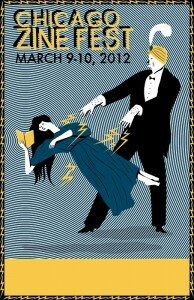 Quimby’s is proud to co-sponsor CZF and congratulates the festival for celebrating 10 years! 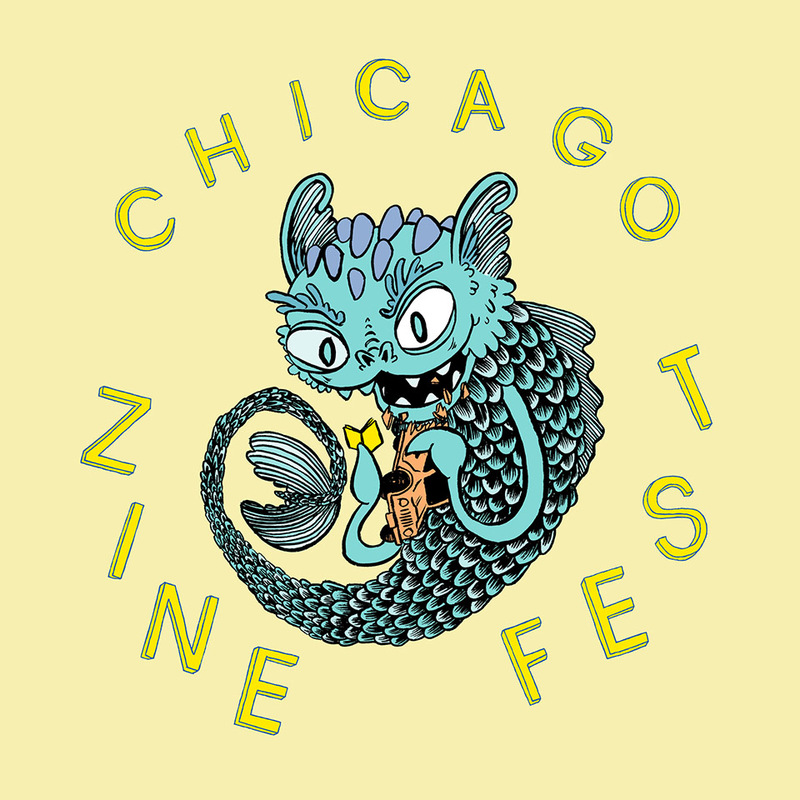 The Chicago Zine Fest is a celebration of small press and independent publishers, with an annual festival of workshops, events, and the big expo day where 250+ zinesters set up tables to sell and trade their zines. All the events are free and open to the public. CZF 2019 will be held May 16th, 17th, and 18th. More info at chicagozinefest.org. Want the Facebook Event Invite for this special Friday double header? It’s here. Tags: #CZF2019, Alejandra Trigoso, Billy the Bunny, Cards Against Humanity, Casey Goonan, Chicago Zine Fest, CZF, David Alvarado, Ed Blair, Eileen Chavez, Exhibitor Reading, Jaclyn Miller, Jami Sailor, John Porcellino, Johnny Misfit, Jonas, Julia Arredondo, Julia Eff, Leslie Perrine, LizMarie Palomo, Megan Kirby, Zine Jeopardy. As an organizer for Chicago Zine Fest, my vantage point is quite different from the view I was once used to, sitting behind a table as an exhibitor. My fellow organizers and I were concerned with making the festival the best we could for everyone, and this meant busying ourselves from September to March, and during Zine Fest weekend, running around and putting out fires (not real ones thank goodness). But now that the fest is over, I wanted to take a minute and recall some of the great things I remember and share them with you. Feel free to share yours with me too. From the moment Lilli sent us the artwork, I was in awe (immediately making it my laptop’s desktop background). We all realized its splendor, and used the imagery for everything from our website to the large banners we had printed up to use at the fest. One of the great things we have continued to do is incorporate amazing artwork from talented local artists and zinesters. If you haven’t gotten a silk screen poster yet, there are still some left. Thanks Lilli. As one of our sponsors for the past two years, Columbia College Chicago’s Silver Tongue Reading Series has been overwhelmingly accommodating to helping make our vision for zine fest events a reality. The Silver Tongue panel gives our invited guests another way to interact with their fans, and allows the audience to be active participants, engaging in the conversation. This year’s panel was no exception. As part of Silver Tongue’s contribution, they curate a cast of student readers that perform before the panel. The 2012 Silver Tongue Student Board really stepped it up this year. Their selection of five female readers brought the goods. The emotions ranged from quirky, silly, emotional, to a bit racy. Booking a lineup of great readers is a difficult. High fives to all involved (Thanks Ian and Fran, Mairead and Jill). First off, mad props to Art Noose for traveling from Pittsburgh, PA, while pregnant. That’s dedication. But what do you expect from a zinester who has released 94 issues (and counting) of the letterpress zine Ker-bloom! Art Noose’s story (which will appear in issues 94 and 95 of Ker-bloom!) was a touching yet outrageous personal narrative about her decision and ensuing adventure to conceive her baby. Her tone was genuine and the story’s movement made everyone root for a happy ending. Her reading at zine fest was one that someday she will share to her child with pride. Thanks Art Noose! This was the event of the weekend that moved me the most. I never met Ayun, who is such a genuinely positive soul. At the fest, I was crammed into an elevator with her and half a dozen others. Instead of bemoaning the situation, she laughed it off, striking up a conversation with us all. If you scan through any of the zine fest photos you will come across Ayun immediately. She’s the woman with the headband that reads ZINES. Now jump to the karaoke after party. By this point in the weekend, most everyone (including us organizers) was so burned out. This wasn’t the case for Ayun. Before she took the stage to deliver her rendition of “These Boots are Made for Walking,” Ayun made a joke about bagels, fitting from the woman who penned the Zinesters Guide to New York. Everyone around the stage about lost it. It was one of those you-had-to-be-there moments. She kept smiling and laughing during the whole performance. Her enjoyment was genuine. It was apparent Ayun was happy to be part of this event, this weekend. Her emotion made me glad to be part of it all of this too. I was filled with excitement for being part of this community. People still care. Seeing everyone enjoy this weekend made all the extra effort planning this festival worth it. Thank you, Ayun. For this, I have no clue where to begin. Billy was one of the reasons I got into zines; the main reason I found out there was a Chicago zine community. He lives in Albuquerque, NM, and has established the Zine Olympics event at the ABQ Zine Fest. Chicago Zine Fest organizers worked directly with Billy to develop the competitions and rules for this version of the Zine Olympic Games. I hadn’t seen Billy since probably the 2010 zine fest but from the instant I walked into Quimby’s for the Olympics he was easy to spot with his set of fuzzy bunny ears bobbing through the crowd. He wore a black and white referee shirt accessorized with a swinging silver medallion. Once the Olympics events began, Billy was non-stop energy. As the official, he was stern, unbending, and entertaining. In the precision folding competition, most notably the tri-fold section, Billy’s judging rung with authority built from his years of being a zinester. Then there were the explanations he gave to support his judgments such as, “Would you send this through the mail?” or “Does this look correct to you?” He was unrelenting. The energy he put forth made the contestants compete hard and kept audience captivated. This event was entertaining for zinesters and spectators alike. Billy was a complete part from the design to the execution of this event. This was my personal favorite event of the weekend. Thank you, Billy. This may seem a bit self serving, but I wanted to take a small opportunity to thank my fellow zine fest organizers for helping put together such an overwhelming weekend. For all the countless days and hours we put into this, for all the memories that this fest generated and for all the smiles that came about, I wanted to thank you for making this year possible. Thank you, Leslie, Jen, Oscar, Heather and Neil. John works at Columbia College as Recycling Manager and is a Fiction Writing student. He self-publishes the Muse, the News, and the Noose, curates the reading series Two Cookie Minimum and is a contributing writer to Gapers Block. Tags: Art Noose, Ayun Holiday, Billy Da Bunny, Chicago Zine Fest, Johnny Misfit, Lilli Carre, Silver Tongue.